The Maison de Verre, a building for our time? 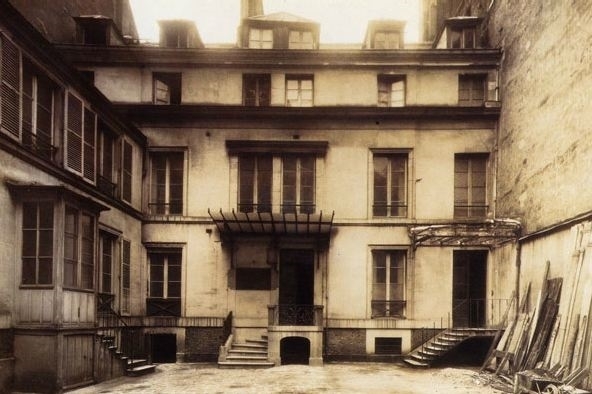 The Maison de Verre (MdV) family residence with a ground floor Doctor’s office was commissioned in 1928 and completed in 1932 for Parisian clients Annie and Dr. Jean Dalsace; the designer, Pierre Chareau, known as a "meublier ensemlier"—a designer of furniture and interiors, wanted it to be a box of light. He collaborated with Dutch architect Bernar Bijvoet and craftsman/metalworker Louis Dalbet. The project became a unique urban infill project, with the legal requirement that the new owners could not demolish the entire existing building on the project site, but had to maintain the apartment the third-floor tenant occupied. The infill project, therefore, retained the third floor of the original building intact as well as the adjacent buildings to the north and south thereby only allowing potential light on the East and West facing courtyards. Those facades were designed to maximize the natural light that would penetrate building; the ground floor of the new structure was used for Dr. Dalsace’s obstetrical practice. The inserted two levels above were the residential floors. The basic materials used for the façade of the house—had been used since the late1800’s to bring light into urban buildings. There is a long tradition of trying to make buildings more transparent with the famous example of the nearby Sainte Chapelle completed in 1248. Pierre Chareau had a very practical reason for the use of all glass facades. He writes in 1927 “The translucent facade is not to use glass for glass, but if one examines the plan of this building to build on the foundations of an old hotel of the 12th century (14 on 14 meters) and taking into account a normal floor height and windows through which the light could be distributed, one realizes that one-third of the old house was deprived of light." Part of what makes this façade of light so appealing is that it is so thin. Though mostly translucent and thus limiting the view but emphasizing light, there is a connection with the outdoors, especially in the hollowed out lens portion of the tiles. But the factors that make the MdV so appealing result in a transparent skin with little insulating value. Condensation collection channels were built into the floor to collect the condensation that naturally occurs on the inside face of the Nevada glass tiles demonstrating that there was a knowledge at the time of construction that condensation would occur. How would Pierre Chareau and his artistic team design and build the MdV today? What innovative products and techniques might they use that have been subsequently developed? 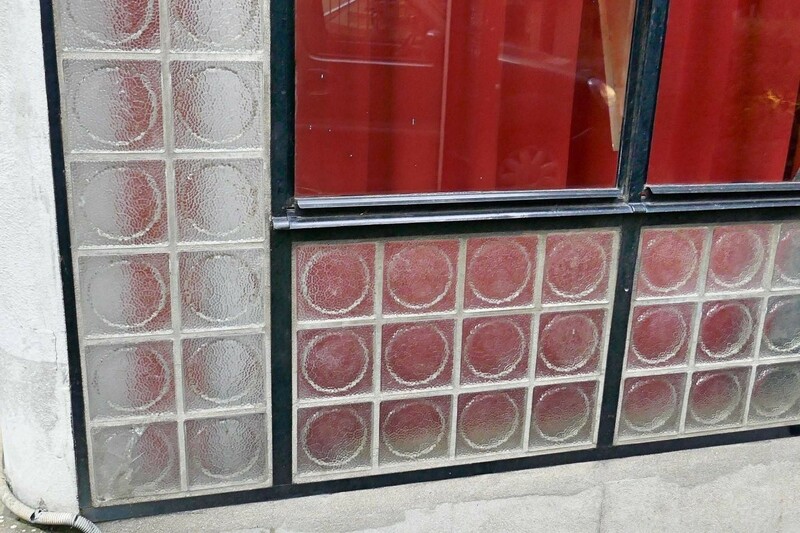 How could the human-scaled and tactile Saint-Gobain Nevada glass tiles be replicated today? Part of what makes the skin of the MdV so appealing is the almost shoji screen scale of the glass tile modules. 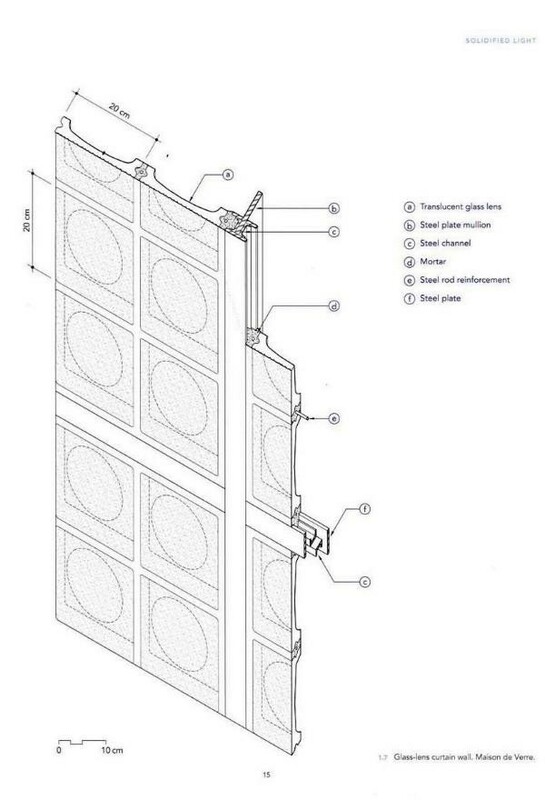 The panel modular is reported to be at partially established by the uncertainty of the maximum size glass panels that could be created thus leading to the 4 lens wide by 6 lens high size modules that we see today. Saint-Goban would not warrant the installation and in fact 20 years later the courtyard side of the building had to be replaced. On this facade, the underlying iron frame between the panels is exposed. On the original garden façade, the iron frame has a parging coat of concrete covering it. One advantage the MdV has as an infill project is that the area for the facade is already limited. The party walls and retained 3rd-floor apartment limit heat loss on those sides. But since most of the interior spaces open right onto the thin glass wall or duraluminum exterior panels, the comfort of the occupants is now dependent on a large hot air heating system. A rough calculation is that 46 percent of the perimeter wall area is glazed and 54 percent is party wall. It is reported that the Nazis were going to occupy the house during WWII but realized they could neither heat or light it. But in contrast to Corbusier's Villa Savoye built at the same time which the owners found uninhabitable due to its leaks and drafts, the MdV continues to function as a residence. Concerns about energy usage are much different today. Both France and the European Union have developed a strict energy code to respond to the concern over climate change. Prescriptive energy efficiency standards have been in place since 1995 and have become stricter in subsequent years. The code is performance-based setting a maximum energy consumption of 40-65 kilowatt hour per square meter depending on location with 60 kilowatt hour/square foot/year (19,020 BTU/square foot) established for Paris; energy consumption considers HVAC, hot-water, lighting, heat recovery and auxiliary systems as well as building envelope. Zero interest loans are available for owners of primary residences of high energy efficient homes. The use of renewable energy is mandatory in all new buildings. France has a target for 2020 that all buildings be energy positive (better than net zero energy). The logical sequence in improving the design of a building’s energy performance is to start with reducing internal and external loads, in other words, improve the envelope performance and reduce the plug loads to minimize the improvements required. Ideally to better understand those loads it is recommended that sensors and loggers be installed in the existing space to create a baseline of energy usage and to monitor the outdoor conditions. That step is beyond the scope of this article. The team of mechanical engineers at J.M. Verostko Engineering Consultants, Youngstown, Ohio, were brought on as co-authors due to their experience in the modeling and design of both VRF and Geothermal HVAC systems. They were able to complete a Carrier Hourly Analysis Program (HAP) model of the MdV to evaluate the building energy usage throughout the year. After several iterations of HAP simulations and exporting data to a spreadsheet for further calculation, the team was able to model the combined system and achieve a yearly energy usage of 18.8 kBTU/square foot/year (59.3 kilowatt hour/square meter/year). This usage is just under the requirement of 19.02 kBTU/square foot/year (60.0 kilowatt hour/square meter/year) set by the City of Paris. Creating a starting point for the HAP analysis was key. The building spaces were accurately created within the model, and all miscellaneous load components were incorporated based on assumptions; i.e. lighting, occupancy, electrical equipment, etc. Each area of the building needed to be included to create the expected diversity in the load profile. Since the exposed facades face predominantly East and West, the building orientation provides great variation in the load profile. A preliminary model simulated the use of gas furnaces for the HVAC system with no other upgrades to the building; the energy usage came out to be approximately 74 kBTU/square foot/year (233.4 kilowatt hour/square meter/year). To improve the envelope, the effect of creating a double glass wall was considered to increase the R-value for the mass of windows on the building. A major point of consideration for the MdV is the existing prismatic tiles and how they work; regardless of the location of the sun during the daytime, the prismatic tiles will catch any direct and indirect light, and with it, solar energy, and project it directly into the building. This also allows for a much lower lighting energy usage in the building. The window alterations made in the hypothetical model would not affect the visibility nor light transmittance through the glass and are only for insulating purposes. The prismatic tiles alone have an R-value of 0.9 (hr °F sqft)/BTU (0.16 [sqm K]/W), however adding an additional two panes of clear glass at the same dimensions and framing size with a quarter inch Argon filled gaps heightens the R-value to 2.1 (hr °F sqft)/BTU (0.16 [sqm K]/W)); the modeling software used calculates the composite R-value between the glass and thermally broken aluminum framing. Changes to the party walls and roof were not made for the energy simulation due to the heat transfer through them being negligible. 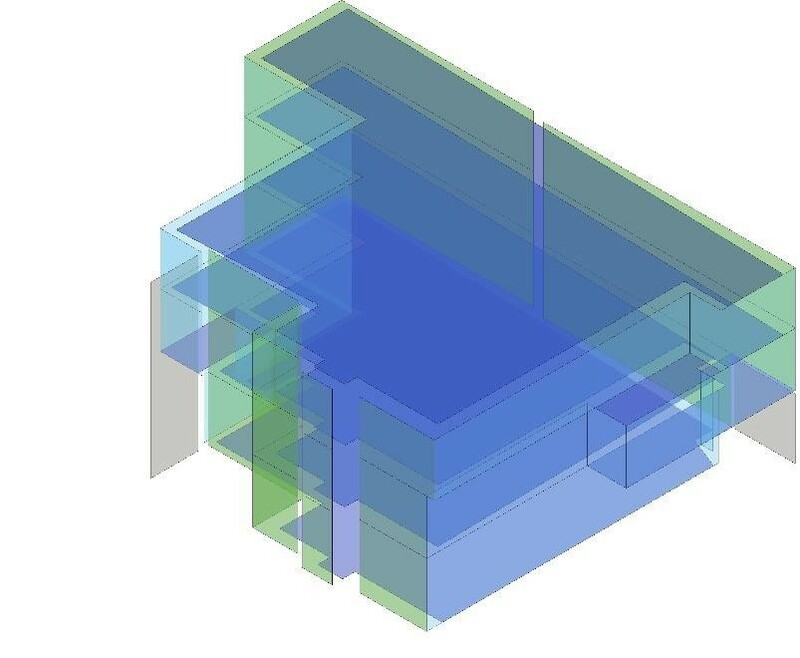 The party walls and the majority of the roof are adjacent to other sections of buildings and can be considered interior walls for modeling purposes. With the changes to the windows, the energy usage for the MdV is reduced to 43.37 kBTU/square foot/year (136.8 kilowatt hour/square meter/year) from the original 74.06 kBTU/square foot/year (233.4 kilowatt hour/square meter/year). This upgrade alone would be responsible for a 52.5 percent reduction in the overall heating load over the course of the year (this reduction in heating load can be seen in figure 1 and figure 2). Once the building loads are reduced, the next logical step is to improve energy efficiency through better mechanical and electrical systems and then to consider the use of renewable and regenerative systems. These approaches were next considered to see if the MdV could meet the current energy performance criteria. To meet the envelope requirement, first, a Revit Energy model was developed. It soon became apparent that this model would not be sufficient for the needs of this analysis due to the limited number of HVAC systems that can be analyzed using that software. The highest likelihood of establishing how the MdV could meet the energy criteria was to model the building with an extremely energy efficient heating, ventilation, and air conditioning (HVAC) system. To meet the renewable energy requirements, geothermal wells were considered to provide the green energy and heat sink. Coupling this system with a variable refrigerant flow (VRF) heat pump system may bring the MdV within energy requirements. With VRF being one of the higher efficiency HVAC systems available and utilizing the free heat capacity of the Earth, the task now becomes modeling the energy usage of the combined system. With a baseline energy usage of 43.37 kBTU/square foot/year (136.8 kWh/sqm/year) known, the modeling of the combined geothermal water-cooled VRF system began. Based on a high variation in building load, the combined system can also utilize VRF heat recovery. This high variation of building load stems from both the usage of the building and differing occupied hours of the doctor’s office and residence, as well as the majority of the exterior surfaces of the building having East and West facing facades. If one were to look at a standard furnace (normally seen in residential homes) or a packaged unit, they can only perform one thermodynamic process at a time, either heating or cooling, and the product of these tasks always produces wasted energy. When that furnace is in cooling mode, the air-cooled condensing unit outside discharges heat energy to the outdoors as wasted energy. VRF heat recovery is able to utilize the energy that would normally be wasted to increase the energy efficiency of a building. Heat recovery in VRF systems, simply put, is the process of transferring heat energy between hot and cold areas of a building and thus not wasting it. If a core space in the building needs cooling and an exterior space needs heating, VRF simultaneous heating and cooling will pull energy out of the space that needs cooling and transfer that energy to the space that needs heating, as opposed to rejecting the energy outdoors. HAP can easily model an air-cooled VRF system with heat recovery; however, the limitation of the analysis program is the inability to model a VRF system with a water source heat exchanger in lieu of an air-cooled outdoor unit. Since HAP VRF system simulation can only model an air source heat exchanger, further calculations are required when coupling with a geothermal system. 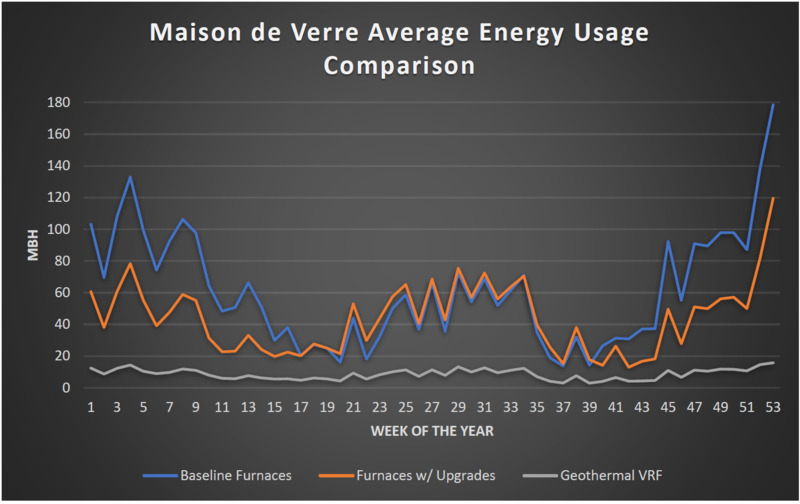 A preliminary hourly system simulation was completed for a VRF system without heat recovery during a generic year using Paris weather data. The simulation provided the full outdoor unit’s kWh usage for cooling and heating for each hour throughout the year. The choice to model without heat recovery simplifies the logic of how the outdoor unit is operating during each hour of the year; whether it is rejecting heat, or absorbing heat. In each hour of the simulation, where cooling and heating loads on the outdoor unit are both present, the higher load dictates what mode the outdoor unit operates in. The smaller load during that hour can be assumed to be met by in-building energy sharing and is therefore set to zero in the calculations. The data from this simulation was exported to a spreadsheet to tabulate the 8,760 rows of data representing every hour of the year. Next, the geothermal portion of the system was added. To arrive at a final energy usage, the geothermal system performance had to be calculated by hand in a spreadsheet. The unique difference with a geothermal water-source system comes from the relatively steady ground temperature compared to highly fluctuating ambient outdoor air temperature. This results in a higher coefficient of performance (COP) and therefore lower energy usage and utility cost. The coefficient of performance of the outdoor unit is used to find the energy usage of the VRF system. Not having relevant part- load performance curves, an average COP of 4.85 (See note 1) was used for the heating and cooling calculations to find the yearly energy usage of the building. 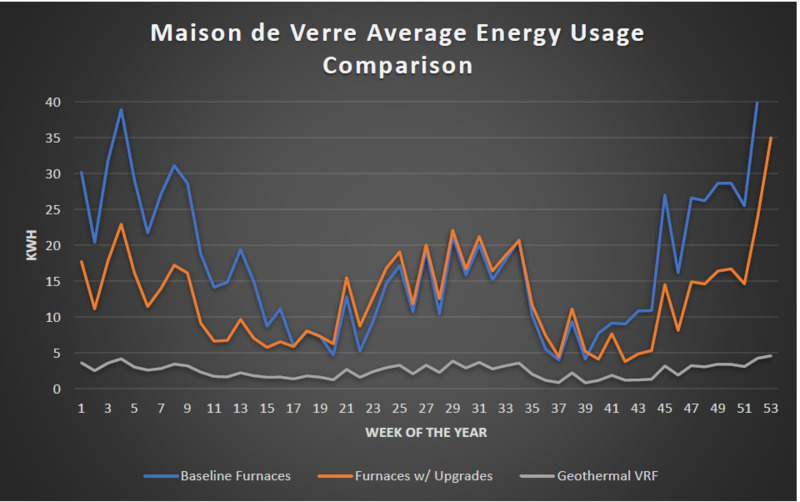 Once the calculations were complete, the energy usage for the geothermal water-cooled VRF system was approximately 18.8 kBTU/square foot/year (59.3 kilowatt hour/square meter/year) – just under the Paris requirement of 19.02 kBTU/square foot/year (60.0 kilowatt hour/square meter/year) (See note 2). When considering the practicality of the geothermal system, the available vertical geothermal well space was also evaluated after the energy analysis was completed. The geothermal field, based on assumptions made, would occupy approximately 8,000 square feet (743 square meters) of ground area in total. This is based on the assumption that at a 400 foot (122 meter) depth and spacing of 20 feet (6.1 meters), each borehole could provide approximately 24,000 BTU/hour (7 kilowatt hour) of heat transfer to the outdoor heat exchanger serving the VRF system. Based on the total building load, the MdV would require 10 boreholes if the building had a balanced load. Due to the climate of the area and building load profile being heating dominant over the course of the year (approximately 125,000 kBTU/year [36,600 kilowatt hours/year] of cooling, and 364,000 kBTU/year [106,700 kilowatt hours/year] of heating), the number of holes should reflect the unbalanced load and was therefore doubled to 20. Due to the size of the field, some of the area would need to be supplied from the neighboring courtyards on the Eastern side of the MdV. Further engineering analysis would need to be done to properly size the geothermal field required for the MdV using proper geological samples and soil conductivity tests. Other upgrades or changes that could be done to make the energy savings even greater include, and are not limited to, thermally broken vinyl or wooden framing for the upgraded windows in lieu of steel or aluminum, one half inch Argon or Krypton filled window pane air gaps, roof upgrades for the section of roofing that is exposed, motion sensors for lighting, daylighting controls, higher efficiency VRF indoor and outdoor units, a higher efficiency pump for the geothermal system, among many other potential changes. The building’s elaborate and ahead of its time natural ventilation system could be tied into an automated system to open and close the apertures when outdoor conditions were appropriate. The framing of the double glass wall and its integration into the existing façade would be a delicate design exercise. The proposed double glazing would need to be carefully integrated into the existing fenestration and operable window configuration especially on the garden (east) courtyard. 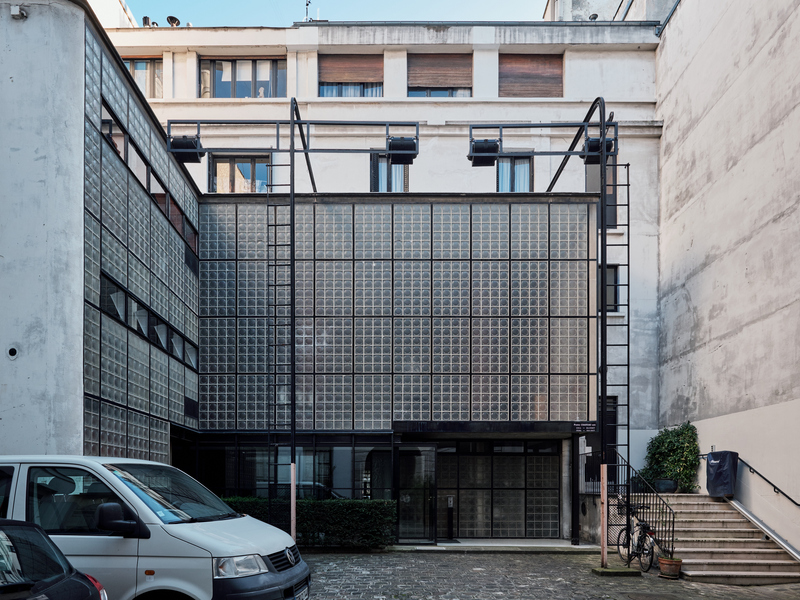 The happy result of this investigation is that a mixed-use building such as the Maison de Verre could be built today using the analysis and features suggested in this article and meet the French and European mandates to combat climate change. Note 1: A COP of 4.85 was assumed due to the building load over the course of the year and how the systems/equipment respond to the same. The building is in heating mode approximately three times as much as cooling. Based on research done, at loop temperatures between 50 degrees Fahrenheit and 90 degrees Fahrenheit cooling efficiency is upwards of eight COP, whereas heating COP is typically around 3.75 to 4. With efficiencies of VRF systems on the heating side being lower than cooling efficiencies at geothermal temperature ranges, the average COP used in the simulation favors the heating end of the efficiency range. With accurate part-load efficiency curves at geothermal temperature ranges, the simulation would have a much more accurate outcome. “Building Walls of Light: The Development of Glass and its Influence of American Architecture in the 1930’s”, Elizabeth Fagan, Graduate School of Architecture and Planning, Columbia University, New, York, 2015. La Maison de Verre, Pierre Chareau’s, Modernist Masterwork - Dominique Vellay, Thames & Hudson, 2007. Members of the Building Performance Knowledge Community Advisory Group, especially Joe Derringer for, their review of drafts of this article. Terry Kretch for early suggestions on energy analysis.